It was a very slow news day yesterday at #VB2017 — NOT!!! 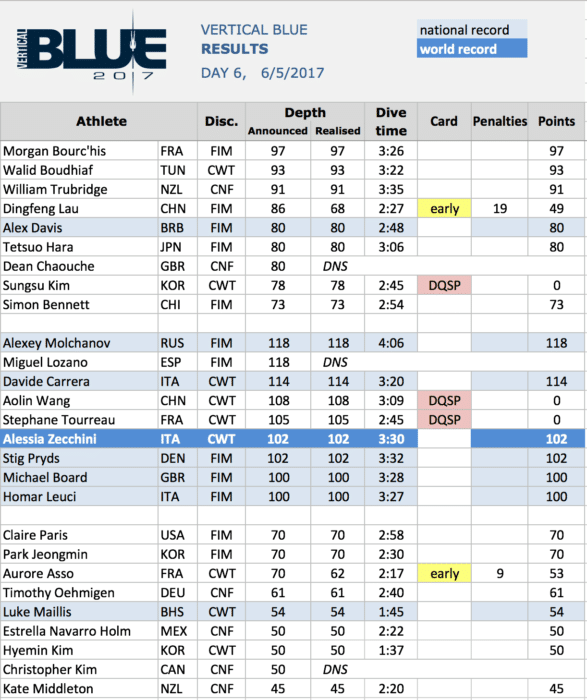 Day six of Vertical Blue 2017 was an epic and dramatic day replete with seven new national records and one massive new world record by Alessia Zecchini of Italy. 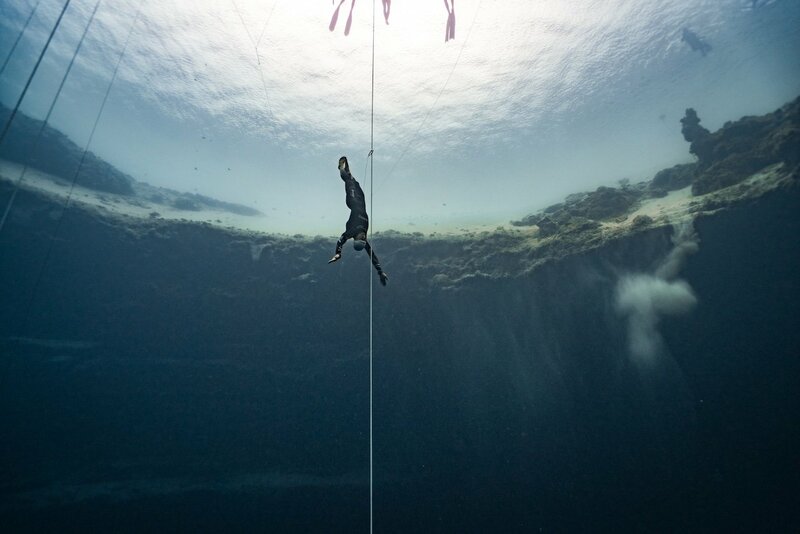 The day started off with two handy white-card dives from Morgan Bourc’his and Walid Boudhiaf. Next up at an unusually early hour for the event organizer, William Trubridge was determined to offer a clean performance in his preferred discipline as his two previous attempts at 90m Constant Weight No Fins (CNF) had only yielded him red cards (and skepticism from some parts of the internet). Shortly thereafter Alex Davis of Barbados set another national record to bring his total to four, and then came Alexey Molchanov. At the top of the second session, Alexey stood out in gold as the skies darkened and the rain came down. 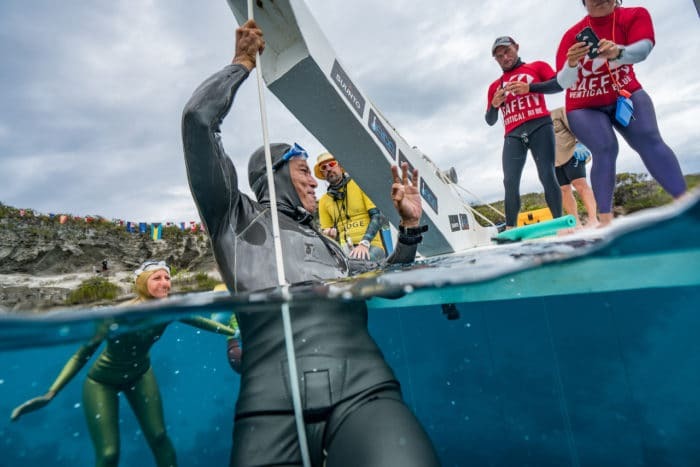 Nevertheless, he successfully completed a free immersion dive to 118 meters which is not only a Russian national record but also a personal best. This PB moves Alexey to the top of the FIM leaderboard and takes points away from Trubridge & Boudhiaf who were both leading only the day before. 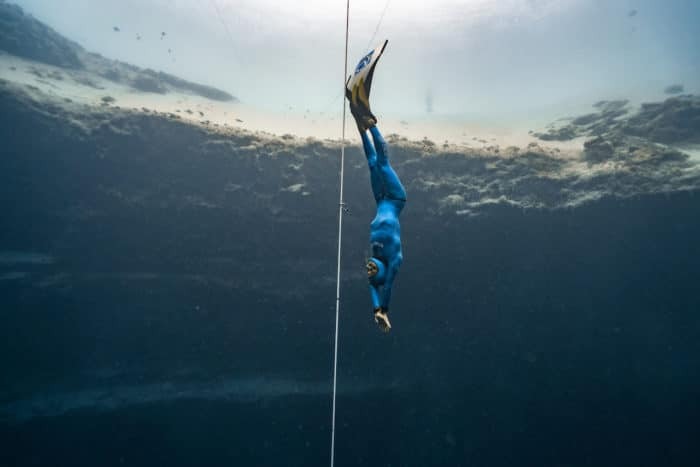 Despite the wind and the rain and the cold temperature, the water clarity in the blue hole remained crystal clear and so was the focus of Davide Carrera, who garnered his first national record of the comp with a constant weight dive to 114m; and the first of the day’s three triumphs for Italy. After Davide, Aolin Wang of China and Stephane Tourreau of France suffered at the hands of time by elongating their surface protocols by two seconds too much, to sadly receive red cards. And then it was Alessia’s turn. 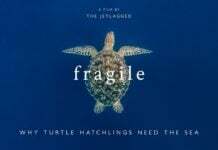 Her slight frame coupled with the increasingly bad weather made it seem like the day would not turn in her favor. But then the clouds broke, the rain stopped, the wind subsided and Alessia entered the arena. Everyone watching was literally holding their breath, and with an enormous sigh, exploded into cheers as the Italian phenom broke the surface. 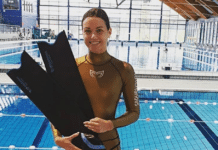 Alessia had corrected her mistakes from before, she kept her hand and her eyes on the line and delivered a timely protocol to ultimately receive the biggest white card of her diving career. As the celebrations continued for many minutes, Stig Pryds was trying to tune them out to concentrate for his dive. And enjoy it he did as he came up smiling and ready to finally receive a white card. 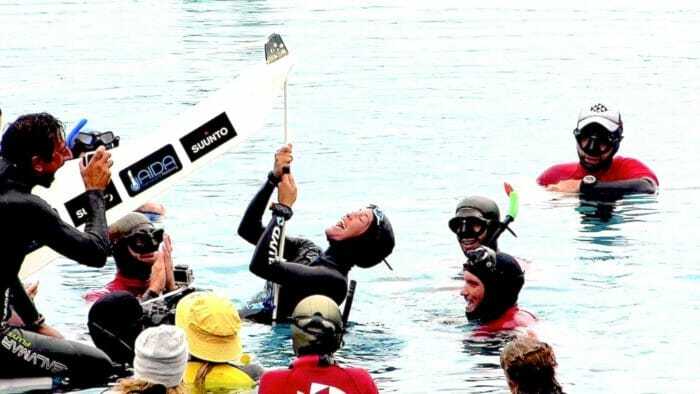 Mike Board came next in a series of consecutive national records, to take back his title for Great Britain in the volley that he’s been having with Dean Chaouche. 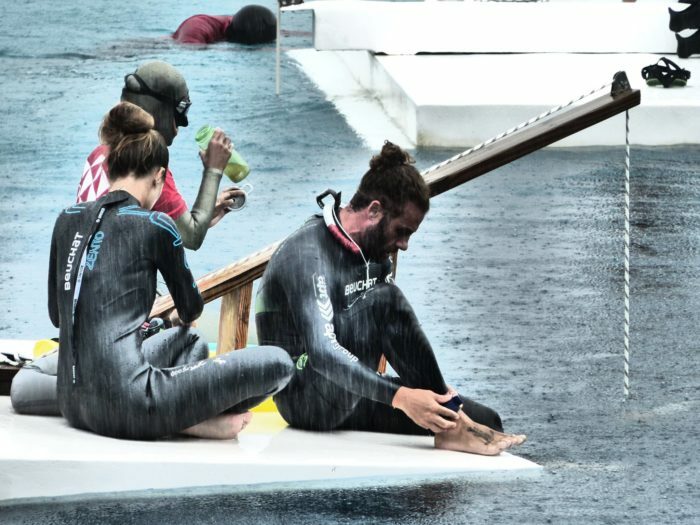 To close the consecutive series and give Italy a hat-trick of a day, Homar Leuci disregarded the foul weather conditions and came through with an impressive dive to 100m Free Immersion (FIM). 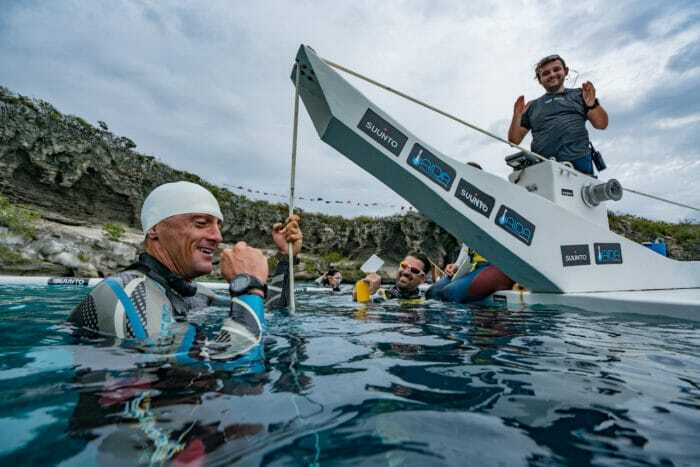 Finishing out the record day was Luke Maillis of the Bahamas; the soft-spoken local took home yet another title in constant weight with a speedy and clean dive to 54m. There is one more Act to #VB2017 and the twists and turns in the leader-board are sure to continue so stay tuned!